Introduction: This diary has survived numerous moves and somehow still remains with me. I didn’t post all of it. Many entries were “We went to church” on Sundays, and “We watched Chips” on Saturdays. A few names were purposely omitted. All spelling/grammar/punctuation errors are left intact for your reading pleasure. Inside front cover: From Aunt Esther, Christmas — 1979 I am 8 years old!!! and turning 9!!! Tues. Jan. 1, 1980 Today we went to church, to start the year in God’s house. The __family came to have dinner with us. I showed them my Lay ‘N Egg game, my painting, my Fashion Plates. We went to the farm and cut wood. Tonight we are going to my grandma’s. She will make Oleycooten. Wed. Jan. 2 Today I had piano lessons. There has been no school for 2 weeks. For christmas I got a new bike, a purse, nail polish, nail remover and perfume. I also got a comb, three necklaces, Fashion Plates and an Lay an egg game. I also got this diary. We have a dog his name is Spottie. We threw are cat in the barn. Thurs. Jan. 3 Today me and my brother went to the farm. I played the piano in the house (Not in the barn) I called my friend Brenda on the phone. Tonight we watched the Waltons. Sat. Jan. 5 Today I went to my friends house. Me and Sara went to the farm too play. This morning me and mom changed my room around. January 7 school starts again and we have to write EVERY SINGLE WORD in cursive! YUCK! Wed. Jan 16 1980 Today it was hot lunch at school. I had piano lessons. Susie S. called me up and told me a bunch of jokes. Thus Jan. 17 Today I had school. Tonight we watched the Waltons. Fred went to Awana. Friday Jan 18 Today I went to school Sara D.B. came over to play. Sat. Jan 19 Today there was NO school. I went to the farm with Dad. Grandma, Grandpa and me went for a walk all the way to Nichoulse road. I got new overalls. Tonight we watched Chips. Tues Jan 22 Today I went to school. (as usual.) I went to Kim’s house and played soccar. She showed me her Barbie perfume maker. Wed. Jan 23 Today I went to school. (as usual.) In school it was hot lunch. I had piano lessons. Me and Fred hauled in wood. (we always have to. yuck.) At hot lunch Mom came to my room. Thurs. Jan 24 Today I went to school (as usual). I made cupcakes. Mom went to the Gospel mission. Fred went to Awana. Tonight we whatched the Waltons. Friday Jan 25 Today I went to school (as usual) It was Dad’s birthday. Tonight we went to Upper Crust pizza and the walked around in the mall. Mon. Jan 28 Today I didn’t go to school because I got sick. Tonight I watched Little house on the Prarie. Sat. Feb. 2 This morning we whatched cartoons and I sorted out lids. This afternoon Joel V.D. came over. Tonight we watched Chips. Wed. Feb. 6 Today I went to school. It was hot lunch and Sara came over and we biult a fort in the snow. Fri. Feb. 8 Today I went to school (yuck.) Well tonight at school there was a play at school called the Electric sunshine man. boy I wonder how they can memorize all those parts. Sat Feb 9 Today there wasn’t any school (yeah) Fred, Randy and Dad went to a harvestore free dinner. Grandma B. came over and gave me a perminent. When dad and Fred came home, they were drawin names and we got the grand prize a harvestore picnic basket. Sun. Feb. 10 Today we went too church. After Church, we went to Aunt Lena’s and then too Grandma’s house for dinner. Tonight Aunt Nellie came over. Mon. Feb 11 today I went to school (of course) After school I went to Sara’s house and we went sking. Tonight we had a baby sitter. Thurs Feb 14 Today was valentines day. I passed out my valentine cards. Fred went to Awana And we watched the Waltons. Friday Feb. 15 Today I went to school (of course.) Tonight Aunt Grace, Uncle Berney, and Betty and Andy came over. We smoked candy ciggars. 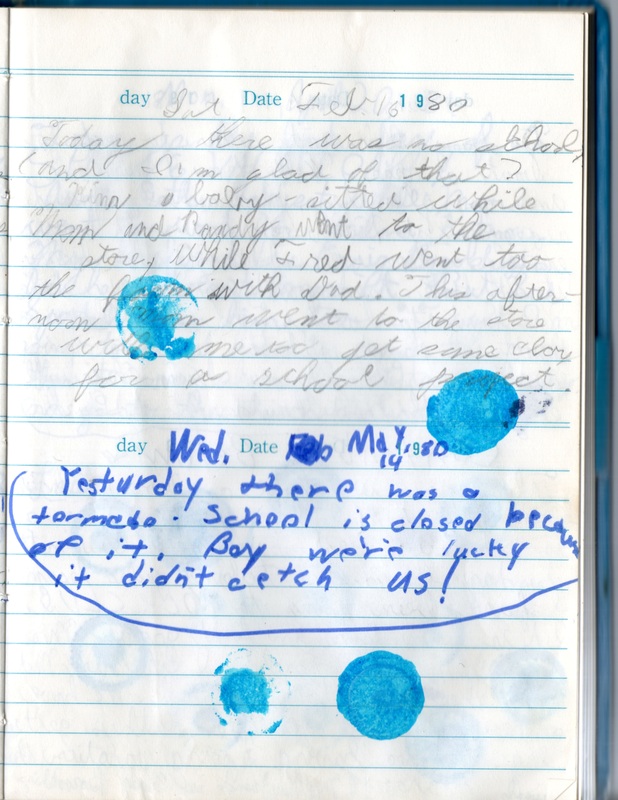 Original diary page. Apparently at some point I went through and put blue bingo stamps on every page. Med May 14 Yesterday there was a tornado. School is closed because of it. Boy we’re lucky it didn’t catch us! Mon. April 20, 1981 Today is the first day of SPRING VACATION! Aunt Esther babysat while Mom went to work for ________ at Friendship Village. My boyfriend is_________but he doesn’t know it. Tonight I’m going to Sue’s house to spend the night then tomorrow she will come to my house and go to the church skating party! This entry was tagged childhood, diary, family. Bookmark the permalink. 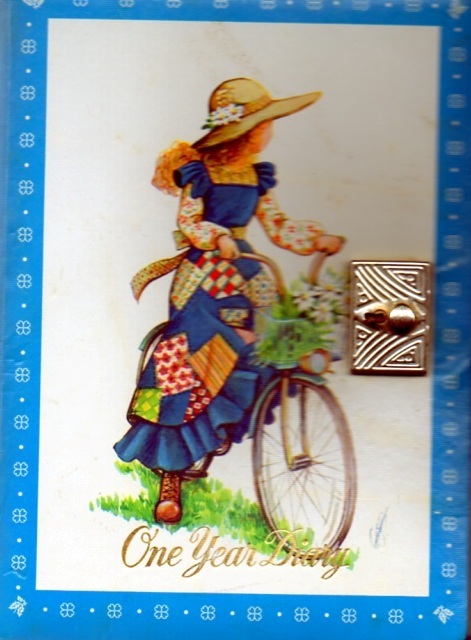 I have a diary from around that age in a very similar style: 2-4 short sentences about the day. Fun to look back on, even if I wish they were more detailed! It’s amazing how it brings back the memories…even those brief bits. What a great and unique idea! I love the voice! it brings back childhood and makes life sound so simple! Thanks for sharing. Thank you. 🙂 It was fun to find this knowing my son will be 8 in a year. Glad you enjoyed it Kittye. 🙂 I spelled it wrong in my diary, but it is also called “Olie Koeken” or “Olie Bollen” a fried Dutch doughnut with raisins. Very yummy. Grandma V. usually made them on New Years Day.